I've had alot of half baked ideas, unfinished projects, and false starts over the last couple years and this is one of them. No promises that this will go anywhere, and also keep in mind that I have no idea what i'm doing! So here's a lifelong dream of mine - the ability to make my own portable computers. Mostly spurred by the endlessly disappointing world of pre-built portables. 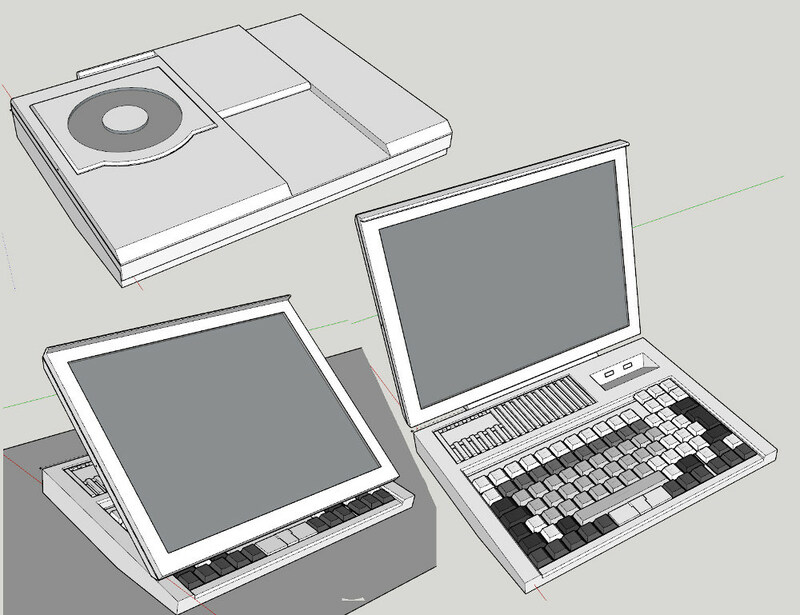 Some laptop designs were pretty good, especially the IBM thinkpads. But now every laptop manufacturer is chasing thinness to a riddiculous degree, leading to small non removeable batteries, cooling issues with more powerful hardware, and some of the worst keyboards and mice ever developed. So naturally i've been thinking about making my own. 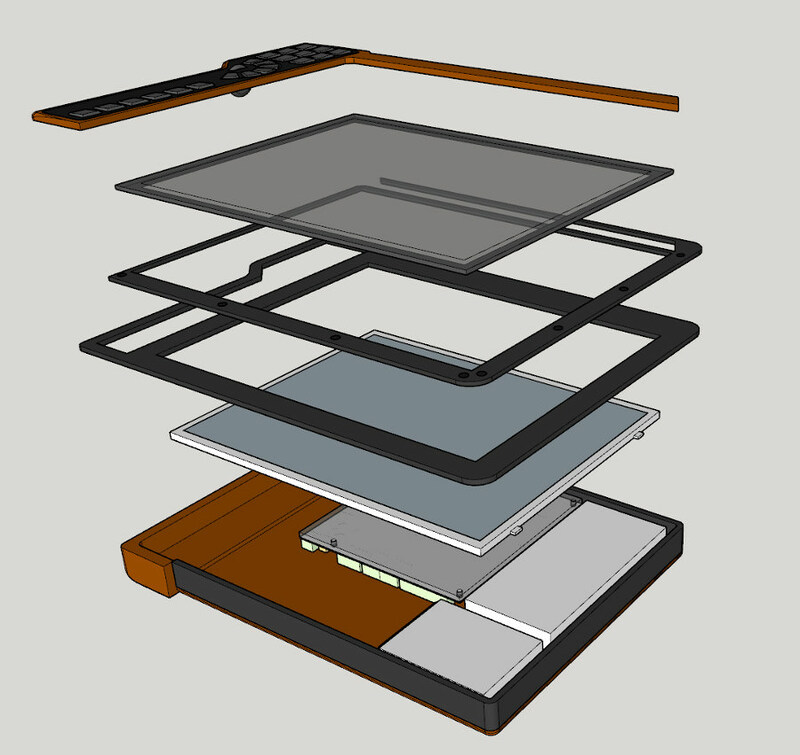 I found a forum dedicated to building pen tablet displays through various methods, and in the thread linked a fella made a couple of laptop displays work. I went and bought the same display, I believe, that he used. I've yet to test if the display or its controller works. I'm a little hesitant to plug the suspicious Chinese circuit into any computers I own. 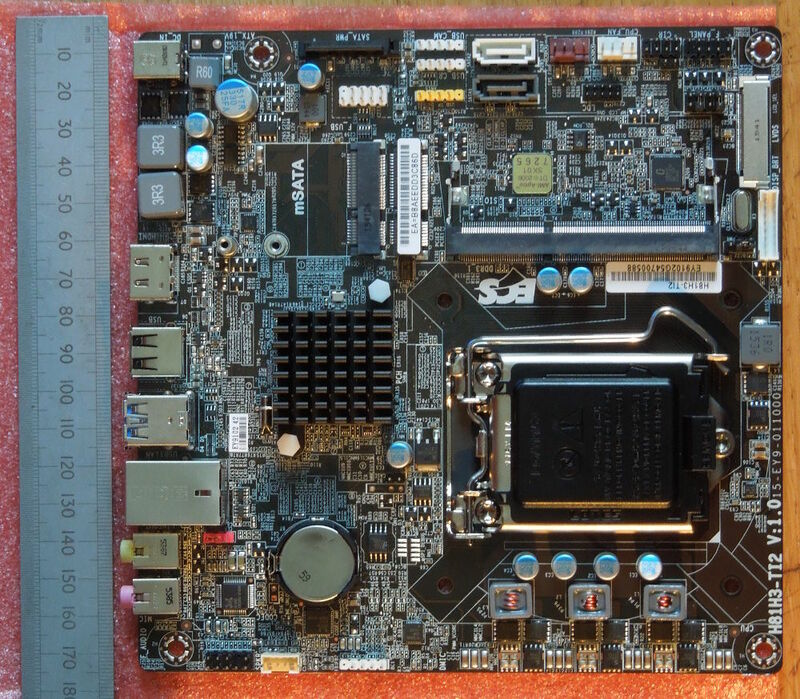 But I also bought a thin mini ITX motherboard that was going cheap on ebay a bit back. An ECS H81H3-TI2. Which has an LVDS output, so i'm probably going to see if that Just Works first before worrying about using the Chinese board. I don't really understand LVDS and there's nothing in the manual about configuring it, but I believe some displays send configuration data over that hopefully the motherboard can handle. I still need to assemble the rest of the hardware which will involve alot of Ebay Disappointment I bet. The board is limited to 8gb of ram and 4th gen CPUs, but that's also what I have in my desktop and the drawing program I use (Krita, excellent program and it's free) is mostly CPU rather than GPU dependant from what i've read. Whatever it is it's going to have to be quite chunky. I've collected a bunch of photos of old tablets and laptops from the earlier days of portables to hopefully inspire ideas. They're surprisingly hard to find, I figured there'd be more enthusiasm for cataloguing them. They were all marketed under the idea of you being able to Compute while standing up, with built in handwriting recognition. I don't think any of them were hugely successful. I was first considering some kind of laptop. Acer recently made a laptop convertible with this style of hinge, the R7. It got poor reviews and Acer prostrated themselves in front of the tech journalism world and made sure their next version was more in line with what everyone else was doing. But I think what they came up with was pretty clever, since it still gives you access to the keyboard while using the pen display. 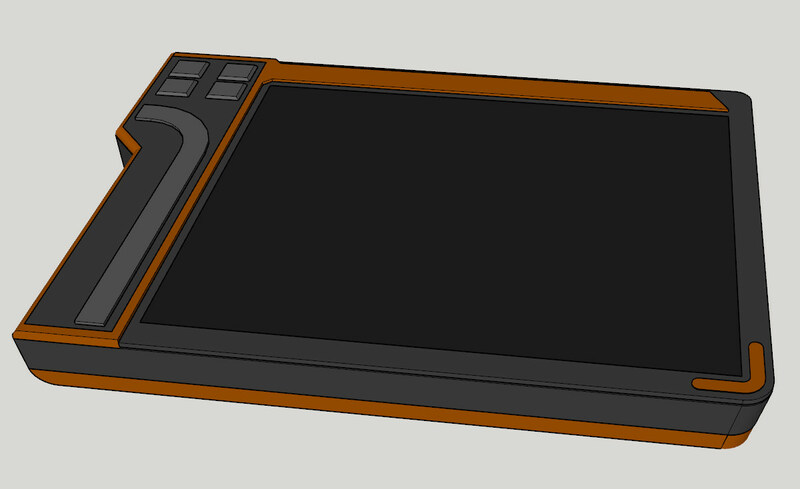 It's kinda similar to the arrangement i've got with the graphics tablet stand I made a bit back to save on desk space. But it'd still be way too complicated to build, and I couldn't find a source for those thin keyswitches that supposedly exist. So I think a more 'normal' style of tablet would be the way to go. It's still early days and I've got some other angles to think about. The reason i'm revisiting this project is becuse i've found myself needing to accurately ink a whole stack of drawings, and with the way i'd been doing it previously (going over the line 20 times and hitting undo till I get it right) it was taking way too long. It turns out that the overhanging graphics tablet stand isn't such a great idea since it gives you no forearm support, and while it works fine for rough sketching from the wrist it's hard to do long consistent lines. So i'm considering some kind of unit that can dock into an angled table. And I might forgo batteries since that's something i'd have to really bodge together and is really outside of my abilities. Plus I don't think i've ever seen anyone use a laptop or tablet away from a wall socket! The first priority will be making sure all the hardware works together though. 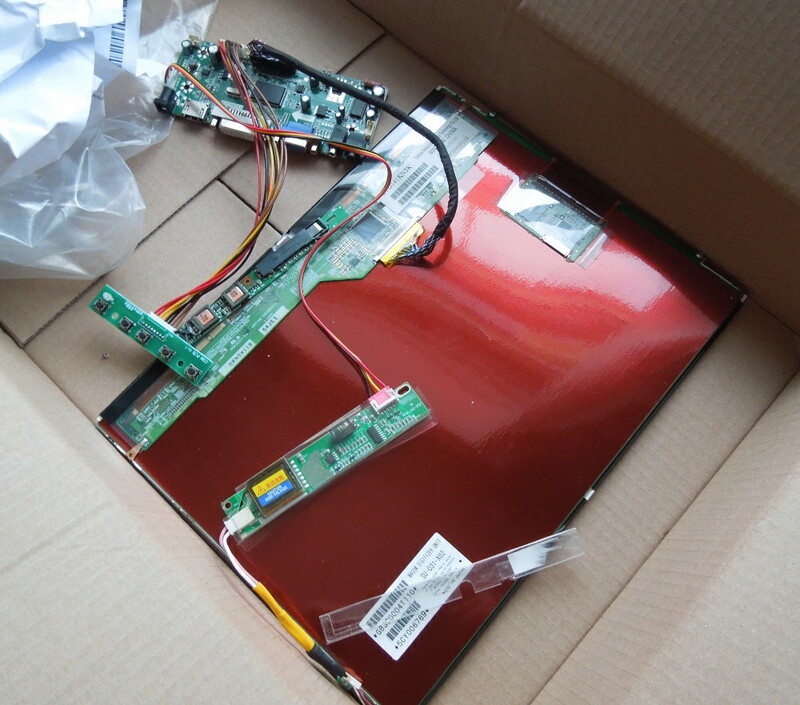 Re: DIY tablet computer, maybe. Hah. Been on a google adventure trying to find what the connector is for the wacom board. Turns out it's a 14 way Hirose DF19. Finding out what it even was was only half the battle, as the other was finding a source to buy one. The usual sites all have a £12 delivery fee for 20p worth of connector, radiospares didn't have any, ebay had a few jokers trying their luck. So I started looking at replacement cables, plugging part numbers in. Eventually found an entire different display for sale with a digitizer board and the cables + inverter included for £10 and went for that. That whole bongofish forum is fascinating though. For anyone that isn't aware, Wacom is a company that makes graphics tablet digitizers for digital drawing - and for a long time they pretty much held the monopoly on them with the high prices that entails. They also sold obscenely expensive Cintiqs, a pen digitizer display. So you can draw directly on the screen. They've also been liscensing their technology to various laptop and tablet manufacturers. Recently some Chinese companies have been massively undercutting them but the driver support is spotty. But I love the idea of DIY alternatives undercutting them even further. In theory a £20 microcontroller, £10 surplus laptop display, whatever it costs for a sheet of acrylic to cover it, and £15 for a controller board could be all it'd cost to have an Official Wacom with fancy drivers equivalent. You could even skip the microcontroller if you can find a digitizer with a USB output instead of serial. My interest isn't / wasn't in digital drawing but rather at sustained hand-held pen computing: working in a fast-paced clinic (in a prison health centre). 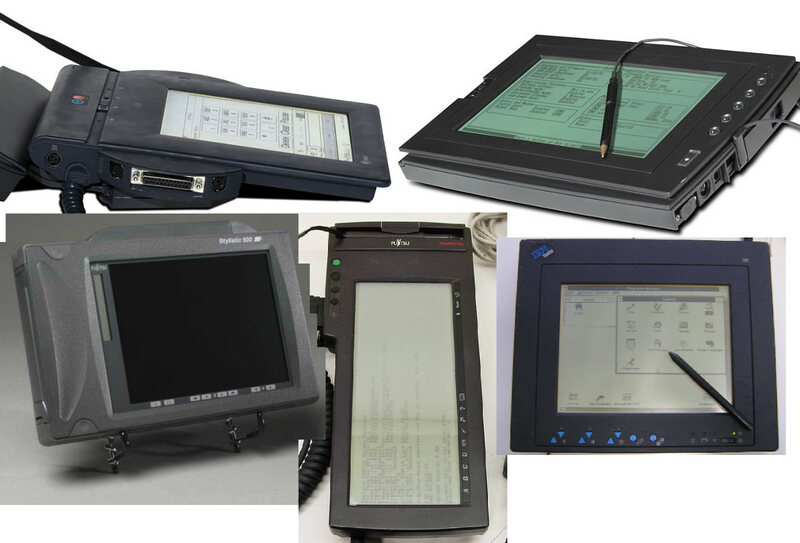 I ended up with older Fujitsu 2300s which had native pen support with two 'mouse' buttons on them, a decent hand-hold on the side of the screen, USB, LAN and - using its PCMCIA ports - WLAN access. Their relative thickness actually made them more comfortable in the hand than the much thinner tablet I use now at home (retired). I have been interested in pen computing for decades in the health field, so I'm fascinated by what you develop for your profession. If I may make a suggestion: don't be limited by what others are doing in terms of shape, consider 3D printing EXACTLY what you design - along with the option of changing things easily for Ver 2,3,4,5 until you have YOUR ideal. Oooh. This will be cool! That's interesting to hear a real world use for those older tablets. I was watching some old recordings of computer news TV shows to try find more tablets to look up and the sales guys always seemed to struggle to come up for good examples of their use. The one they kept going for was 'an estate agent could input a clinets information while standing and taking to them'. Wish I did have a 3d printer though. I was thinking of leaving this whole project till after I build one since it'd make it alot easier, but I think I should be able to put something together with what I've got using wood and metal, even if it might look stupid. Even if it's entirely unrelated to tablets, the kinda look i'd like to go for is something like the Madsen LAR. Those forgottenweapons videos are pretty good if you've never seen them before, it's surprising how much history you can extrapolate from just looking at guns. But I think those rifles are the nicest looking mix of wood and metal i've ever seen. But i'd also settle for something clunky looking that just works! Right now i'm trying to find a viable CPU. The motherboard i've got only supports the 4th gen intel Core CPUs which are still quite expensive for the higher end ones second-hand. I also would ideally want one with the lowest TDP rating possible since i'll only have a small heatsink. I might try get a cheaper low end one just to see if this stuff will work before I consider going all out. Blargh, so much for cheap PC parts. Spent £50 on a 4 year old i5-4590T CPU that hopefully wasn't ran full blast since its manufacture. 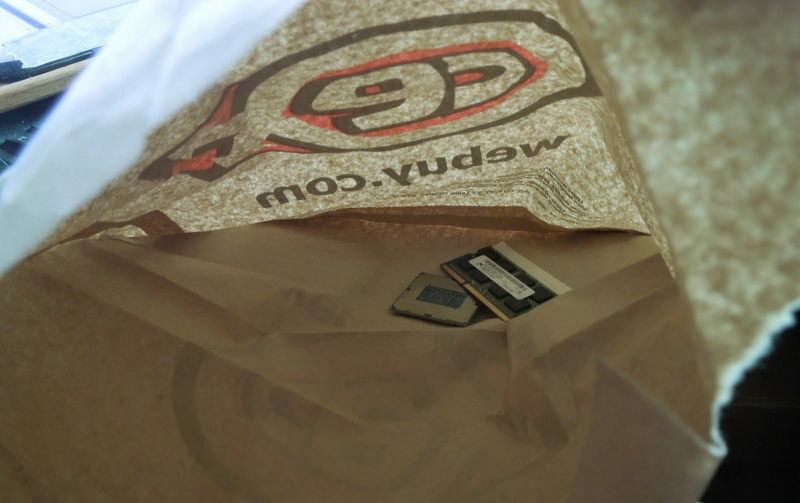 The i3 chips turned out to be more expensive than the i5 ones. By coincidence at least the motherboard I found uses the same range of chips as my desktop, and the processor I just bought is a little bit better than what i'm currently using. So assuming what arrives is functional I can shove that into this computer if all else fails. The whole computer parts world is in a weird place at the moment, mostly because of bitcoins. Graphics cards are especially hard hit with the prices rocketing, although starting to come back down a bit as the hysteria fades, since most of the calculations are done on the GPU. I figure people must be buying up second hand CPUs and other hardware to assemble mining computers as cheap as possible, and perhaps people assuming that i3s are the cheapest option has people fighting over those before looking at the mid range chips. There was that whole reveal a bit back that most of intel's performance gains in the last few years has been through removing security features. Which were eventually discovered by no-goodniks and had to be patched in, massively tanking performance on alot of chips. I hear intel has given up alot of its R&D, and focussed more on directly competing with ARM and the low power chips, so their desktop stuff has been somewhat stagnant and most of the developers have quit for hopefully better jobs. But maybe the performance changes have made the older chips seem just as good as the newer ones. I think all I need now is an LVDS cable. I hate shopping. Hope nobody minds these rambling posts! The motherboards manual is pretty barebones on the info included. But in the diagram legend it says "LVDS connector (For All-In-One Specification)" so i've just looked up what all-in-one specification means. Intel has a big bunch of documents that are thankfully publically available outlining the thin mini ITX specification in more detail than I can understand. But right off the bat it says 40 pin LVDS when my screen uses 30, so that dashes all hopes of it just working right off the bat. Should've counted those pins to begin with! LVDS is interesting. It's hard to find any info on it, along with inverters, but from what i've read it's barely a standard. It seems every manufacturer just changes stuff around even between models, as a joke, so little is interchangeable. But thankfully most displays are making a move towards eDP which is more standardized. But apparently really hard to make work right in a DIY sense since it's all RF black magic. It's still exciting though, since a lack of standards is a big part of why DIY portables are uncommon. If I have some success with this build then it might not mean much to anyone else, since i'd be using a specific display model and specific digitizer model that might become hard to get ahold of if even just a few people decide they want to follow my steps and buy them up. I'd be surprised if that were to happen though. Hell i'll be surprised if this works at all! So yeah i'll need to slap that Chinese board in the middle. But that runs off of 12 volts when the motherboard takes 19. I'd slap a buck converter somewhere in the line but I'm not sure if they'd have some kinda... whats the word. Transients? That might upset the motherboard. Here's a concept. Dimensions are about 400x270x40mm so it's quite a big thing. The general idea though is to have an aluminium or maybe steel plate for the top, an aluminium or steel band bent around into a kinda squareish shape for the sides, wooden bottom, then some kinda grip thing on the left with buttons. The idea is that there'll be some buttons arranged in a fan to match the arc of your thumb when holding the left. It'd probably end up so heavy and off to the side that picking it up one handed wouldn't be feasible, but resting it on your lap or on a table you'd likely still be holding it with a hand to steady it. I did consider that, and made it an effort in the past. But with the world moving towards 4k i'm starting to consider regular HD to be getting old. Not that i'm in love with 4k. 1920x1200 is ideal, with pixels so small I cant see them with the display at a comfortable distance that doesn't require panning your neck around to see the edges. But I guess they've gotta make us buy new stuff somehow. On a normal pc if the picture is as wide as you make it you have to use the slide bars to scroll about, but if there is more than one picture as soon as you move the first you've lost the scroll bars It's also an unnecessary waste of band width . Some pictures (such as circuit diagrams for instance) sometimes need a higher resolution, but in the example of your picture above, no meaningful detail would be lost. Here it is at a 800x600 pixel resolution and nothing has been lost !!!! Going to a place tomorrow to pick up a mirror for some DIY work, i'll probably see if they can do 3mm tempered glass or know anywhere that might. I believe tempered glass has some light polarizing properties that might interfere with the display though, but maybe that's just car windows that are also laminated. Simon, sorry, it really messes up my own screen when trying to read a thread if people use img tags with photos exceeding 800 pixels. Please consider either attaching them if larger, or keeping to the forum requested limit of 800 pixels for linked photos. I appreciate it, buddy. It's starting to look a little Star Trek. I think its the button arrangement. Still considering if this is the ideal way to go about it. I figure it'd be best if the plate glass is supported all around on a ledge that it's glued into, and the easiest way for me to make that would be with two layers of... perhaps aluminium. Prices might put me off when I check! Then the screen itself is just screwed on behind, saving it from taking any of the pen pressure. Question is - how do I stick the two plates together. Welding would distort. It'd be too thin to hide screws. Loctite is expensive and I don't have a whole lot of faith in adhesives... maybe I could stick rivets in, ground flush, and paint the aluminium rather than anodize it. For starters I've never anodized before and that's a whole art from what i've seen, and paint/ filler could hide the seam. Y'know I could probably make it at least 30mm narrower but I need that decorative strip! If I could rely on some kind of adhesive then I could replace the top plate entirely with the glass plate, but then i'd need to ditch that strip. I think i've got it. If I move the black dots a few mm towards the screen then they line up with the band that goes around the edge, and that'd give load of engagement for some long countersunk screws and sandwich all 3 parts together. Then I can loctite those in and fill the holes with bodyfiller. I may be able to assist. They are (for the most part) held together with Weldon #16 glue, the exception being the front screen with it's border mask. The mask is created by just lasering through the cover paper, peeling off the outside part, sand blasting and 4 coats of Krylon fusion paint. Once this is cured, we glue it into the stainless case with some neutral cure silicone. Edit: Seriously I hate this shop. I got dragged in a few times last year when I was in the city more. It's got decor that says 'we think you're a bunch of idiot mental teenagers'. Thanks for the info. It is very tempting to go with acrylic. I have access to laser cutters through several angles too. It never ends. I've been looking at power adapters. The big document recommends over 120 watts and the manual quotes 19V but all I can find are power supplies at 19.5V. I've got a 65 watt laptop one with the right connector at that voltage so after some thinking I decide I might as well try it. 19.5 is well within the usual +/-5% quoted. Anyways there's no signs of life. I've probed the supply and unconnected it's putting out about 16 volts but that might be some standby/ no load thing. I guess I could try order a more suitable supply, they hover around £20-30 second hand. But boy these things all add up. Edit: This is gonna turn into sunk cost fallacy. Another Edit: So I've tallied up the price of things. I've been buying things here and there since the new year so i've not felt it as much as these few recent purchases. The current total is at £193. I think it's generally seen as... uncouth or something to talk about price and money. But if someone says somethings cheap or expensive it's really a relative thing and it's hard to tell how they personally value things. For me £193 is definitely in the 'yowza!' territory. Actual prices are probably important so people can see how much it's worth the idea of making your own mains power only tablet computer with a high chance of failure against just buying one. Plus calling it a tablet seems like a stretch if it's mains only. It's closer to an all-in-one PC really. I would not feel too bad. I have done so many projects like yours, where I thought "this seems so easy, I just need a few cheap components and can do the rest myself to end up at a Thing 1/10th the price and 10 times as nice for my particular needs". A few decades later, I know that the guys which say "DIY = 10 times as much time, 10 times as much money, 1/10 quality" are mostly correct. 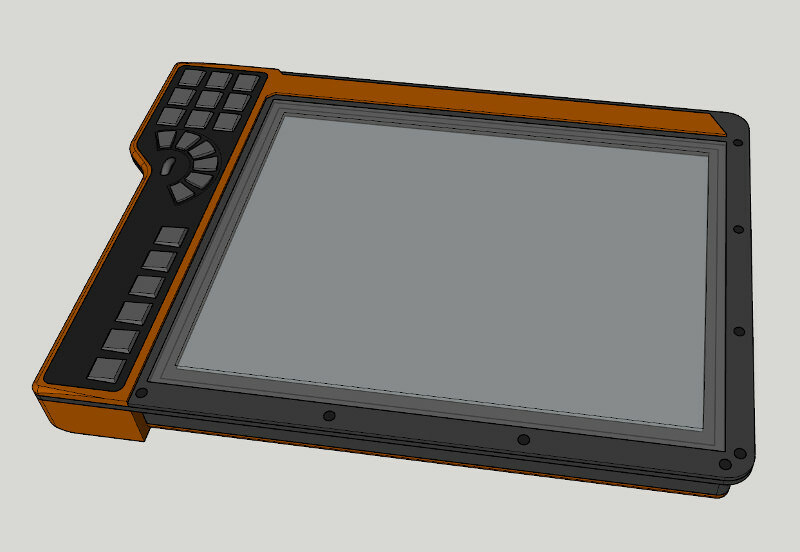 So, go on and build your tablet, looking forward to what you come up with in the end! Yeah I feel that. Alot of it is for its own sake, because I enjoy it despite the complaining, and to see whats possible. I also consider it as a sort of installments thing. £20 here and there is alot more agreeable and easier to handle than dropping £500 all at once. Or worse than that, having to continue paying it off after I find all the shortcomings with the device. I am a huge fan of 3M VHB tape. They make a clear version for glass. I believe it is the the same acrylic adhesive most manufacturers use for bonding windows and windshields for everything from aircraft to cars. It is also extensively used in the construction of the Burj Al Arab hotel in Dubai. Once you stick it on, you can never get it off again. It is also easier to apply than liquid adhesives. You can make Gorilla glass. That sounds ideal for sticking the glass down, and in general. I'll check it out. I did look into that a bit back. The big advantage of chemical glass is that it can be really thin and flex a good bit before it breaks. Ideally i'd want thick enough glass that it shoudn't bend much with pen pressure applied. 1. Store it on ziplock, or edges will atract fuss (my daughter stored it with some clothe and it sitill is fine for most uses, but not between two glass/plastic panels. 2. Getting backing off takes a little practice. I leave a little excess outside, surplus backing underside, apply tape, remove the backing on surplus side and cut off the "tail" before joining two panels together. 3. Sticks to everyting and only thing it did not work was sticking a shower handle holder on the tile on the bathroom, it had tilting load and it eventually crept. I have used it on the fixtures to hold material that is drilled, sawed, cut, routed, sanded and it has been nearly perfect. Only on latest ocassion I thinkt that I did remove all of it and it interacted with sprayable alcyd paint (some roughness). Higbly recommeded instead of glueing.